To Cite: El Zir E, Doumit M, Chahine R. Nicotine Addiction and Hearing Loss in Young Subjects From Beirut, Lebanon, Int J High Risk Behav Addict. 2016 ; 5(4):e31522. doi: 10.5812/ijhrba.31522. Background: Many studies have established an association between cigarette smoking and Hearing Loss (HL) mostly in subjects working in noisy places. However, few studies are devoted to the relationship between environmental noise and smoking through nicotine addiction. Objectives: The present study aimed to examine the effect of nicotine dependence on hearing loss and its association with environmental (non-occupational) noise among young subjects in Beirut. Patients and Methods: The study recruited smokers (100) and non-smokers as a reference group (100) aged 21 to 50 years living in noisy or quiet areas of Beirut [70 to 90 A-weighted decibels (dBA)]. After filling out a questionnaire related to medical history and lifestyle risk factors, including smoking and exposure to noise, each volunteer was subject to a hearing assessment including otoscopy and screening pure-tone air. The incidence of hearing loss was defined as a pure-tone average of thresholds at 2000, 4000 and 8000 Hz greater than 25-dB hearing level in either ear. 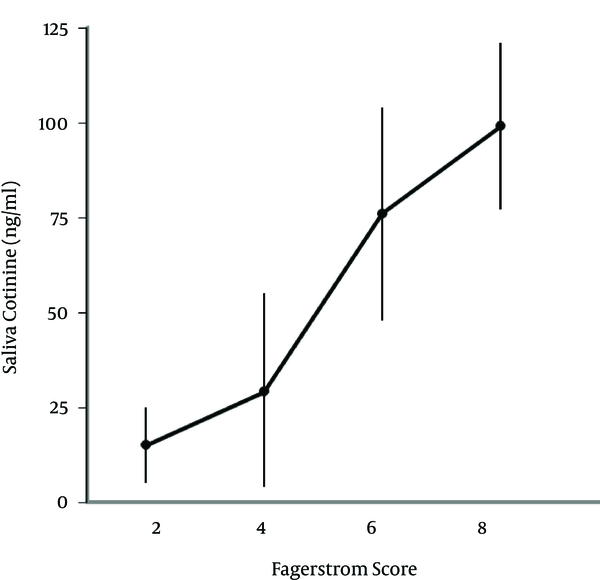 Smokers were referred to perform the Fagerstrom test for nicotine dependence. A saliva sample was also collected from all subjects for cotinine determination, a biomarker of exposure to tobacco smoke. Results: The obtained results showed that smoking is associated with hearing loss at 8000Hz after age 40. Current smokers are 1.73 times as likely to have hearing loss as nonsmokers (P < 0.05). Saliva cotinine levels were divided into three categories: group 1 (< 15 ng/mL), group 2 (16 - 75 ng/mL) and group 3 (76 - 125 ng/mL). The incidence of hearing loss in each group was, respectively, 13 %, 16% and 23% (P < 0.05). Conclusions: The significant difference between groups 1 and 3 permits to establish a correlation between degree of nicotine addiction and hearing loss. However, further studies are needed to identify the mechanisms leading to hearing loss. Smoking is still the most widespread addiction worldwide. In fact, tobacco addiction may be compared to heroin craving in difficulty to quit. The damage caused by inhaling toxic substances from cigarettes is widely reported. A vast amount of data definitely points to a connection between smoking and diseases of the cardiovascular system, lungs, and malignancy (1, 2). On the other hand, scientists have recognized the danger smoking presents to hearing for almost 40 years, though this danger is not studied to the extent of other tobacco-related health risks. Thus, the few reports regarding the relationship between smoking and Hearing Loss (HL) remain equivocal (3, 4). While HL is common among elderly individuals and mostly due to presbyacousis as a normal process of aging, it is less common among young people and is more frequently caused by a combination of genetic and environmental factors. Smoking could be one of the risk factors associated with noise-induced HL (5, 6). In this context, most surveys were performed in specific places, targeting subjects submitted to occupational (industrial) and non-environmental noises. Environmental noise (also known as community noise or residential noise) is defined as the noises emitted from all sources except that of the workplace (4, 7). The main sources of community noise are traffic, construction, public work, and neighborhoods. The open air electricity generators in Lebanon, as well as the frequent use of car horns by drivers, present a significant source of environmental noise pollution across the country, and the heavily populated capital Beirut. The present study aimed to examine the effect of nicotine dependence on HL and its association with environmental (non-occupational) noise among young subjects in Beirut. Fagerstrom test was employed to assess nicotine dependence (8) and cotinine levels in saliva (9, 10). To the authors’ best knowledge this is the first study to examine the relationship between nicotine addiction, environmental noise and hearing loss. - G 1: Non-smokers living in different quiet areas of Beirut (n = 50). - G 2: Smokers living in the same quiet areas (n = 50). - G 3: Non-smokers living in different noisy areas of Beirut (n = 50). - G 4: Smokers living in the same noisy areas (n = 50). All subjects completed the questionnaire including personal data (age, gender), home and work address, smoking status, number of cigarettes per day and duration of smoking in years (using Fagerstrom test for nicotine dependence), as well as all activities or diseases related to hearing. Subjects who used to smoke, frequent users of mobile phone, hunters, soldiers and ex-soldiers were not included in the study (to rule out acoustic trauma as a cause of hearing loss), as also the subjects with a history of any HL diseases. Subjects from noisy areas were the ones living in noisy areas for at least 20 years, and have their home or workplace on a main street. Subjects from quiet areas were the ones living and working in the same area, and should have never been in noisy environment for more than one hour a day. Smoking categories were defined as follows: non-smokers namely those who never smoked, and smokers divided into three categories namely those who consumed < 10 cigarettes/day, 10 - 20 cigarettes/day and 20 - 40 cigarettes/day. Outdoor noise was the parameter used to assess the community noise in eight different points of Beirut situated in the corresponding residential areas of the examined population. Measurement of community noise was performed with a sound level meter. Authors used the world health organization (WHO) guideline values to evaluate the measured noise levels. Noisy areas were defined as the places where noise frequencies exceed 65 A-weighted decibels (dBA), and quiet areas were defined as places where noise frequency was below 65 dBA. Subjects underwent an examination including: otoscopy, screening pure-tone air-conduction and bone-conduction audiometry between 500 and 8000 Hz. HL is defined as a pure-tone average hearing level in the ear of greater than 25-dB for 1000 and 2000 Hz, and greater than 40 dB for 4000 and 8000 Hz. Hearing tests were performed in a sealed, soundproof room with a calibrated clinical audiometer. Cases were defined as those subjects in the top third of the hearing loss distribution (at 2, 4 and 8 kHz) for their age category, and controls were defined as those subjects in the lowest third of the distribution. Prevalence ratios (PR) of hearing loss with 95% confidence interval (CI) were calculated for every factor; a subgroup analysis was then performed taking younger non-smokers not exposed to environmental noise as a reference group; double and triple exposures were evaluated. Finally, a multivariate analysis was performed, where logistic regression with hearing loss at every frequency was taken as a dependent variable while age, smoking and noise exposure were treated as independent variables. Nicotine is known to play an important role in smoking addiction in adults. Nicotine has a relatively short half-life (approximately two hours) in the body so that its plasma concentration is primarily a measure of the last few cigarettes smoked. Cotinine, a major metabolite of nicotine, has a longer half-life (approximately 16 hours) and its concentration in plasma and saliva is used as a marker of nicotine intake in adults (10). Saliva was collected in a plastic vial in the early morning before eating or drinking. Samples were frozen at -20°C. Saliva cotinine was measured by capillary gas chromatography and nitrogen selective detection, a technique described originally by Feyerabend and Russell (11). Briefly, after centrifuging the saliva sample, a 0.5 mL aliquot is taken for analysis and N-ethylnorcotinine is added as an internal standard. Then 2 mL of dichloromethane containing 0.01% of triethylamine is added, followed by 0.5 mL of 660 ammonium hydroxide solution. The triethylamine is meant to prevent adsorption of cotinine by glass surfaces. After vortexing and then centrifuging, the aqueous layer is discharged and the dichloromethane is transferred to a 2 mL GC auto sampler vial and evaporated to dryness. The dry residue is transferred to a 0.3 mL GC auto sampler vial using three washes of 100 μL of modified dichloromethane, whilst the liquid in the smaller vial is being evaporated. After evaporation of the small vial to dryness, 100 μL of modified dichloromethane is added and the vial is sealed and shaken. The current study used an optic injection port in the solvent purge mode (not used by Feyerabend and Russell), 50 μL is injected from the auto sampler vial in about five seconds. After one minute, the optic split line is closed and the injection port heated to 275°C. The method had a between-run variation of about 5% and a detection limit of 0.1 ng/mL of saliva. Prevalence ratios (PR) of hearing loss with 95% confidence interval (CI) were calculated for every factor; a subgroup analysis was then performed taking younger non-smokers not exposed to environmental noise as a reference group; double and triple exposures were evaluated. Finally, a multivariate analysis was performed: a logistic regression with hearing loss at every frequency was taken as a dependent variable and age, smoking and noise exposure as independent variables. The x2 test for general association was used to estimate the relationship between levels of serum cotinine and self-reported smoking status, and between those two variables and incidence of hearing loss. An F test for linear trend was used to assess the relationship between levels of serum cotinine and mean pack-years. A subgroup analysis of three factors (smoking, noise, age) is presented in Table 1. The lowest prevalence was observed in the control group of non-smokers, not exposed to noise, aged 21 - 39 years (6.0%) and the highest prevalence for smokers exposed to noise aged 40 - 50 years (31.0%). Analyzed separately or in a combined manner, smoking, noise and age were not positively associated with hearing loss, except for the combination of smoking, noise and age to 8000 Hz, with a prevalence rate of 3.36 (1.25 to 9.6), P = 0.01. The results of the current study suggested that smokers over 40 years (smoking more than a pack a day), exposed to community noise, had an increased prevalence of hearing loss. As shown in Figure 1, salivary cotinine concentration is significantly linked to the number of cigarettes smoked in the last 24 hours. Table 2 presents the saliva cotinine levels related to the number of cigarettes smoked/day and in association with hearing loss at 8000 Hz becoming significant when the number of cigarette/day is > 20. Finally, there was a positive correlation between cotinine levels and the score obtained from Fagerstrom test for nicotine dependence (Figure 2). Figure 1. 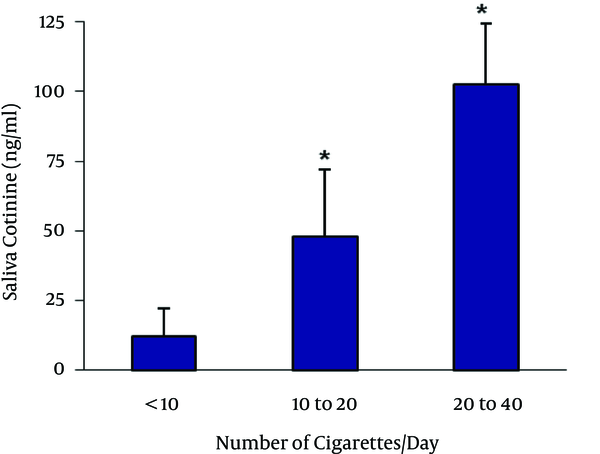 Correlation Between the Number of Cigarettes Consumed and Saliva Cotinine Levels, * P < 0.05. The current study on environmental noise is original insofar and the introduction of salivary cotinine test is added as a marker of nicotine dependence in addition to the Fagerstrom test. In fact, this latter gives only a rough estimate of nicotine intake and needs to be supplemented by biochemical measures. Cotinine is most frequently assayed in plasma samples. Plasma cotinine concentration is highly correlated with tobacco smoke exposure (12). Despite the reliability of plasma samples, blood test results often presents logistical problems in a research setting. Taking blood specimens is invasive and can cause stress and discomfort in some participants. The use of saliva provides an alternative. Salivary testing offers a cost-effective, convenient, non-invasive method to assess cotinine levels and eliminates the discomfort of blood test results. Beyond the logistical advantages, previous research in adult populations suggested that saliva and plasma cotinine levels are highly correlated and have a similar terminal half-life in both matrices (13-15). In the context of this topic, there are few studies on the combined effects of smoking and exposure to noise among the young subjects. Most of these works, as mentioned above, are related to industrial or non-community noise starting from the first study by Zelman et al. (16) who compared 126 male smokers with 126 male nonsmokers matched by age at a Veterans Administration Hospital, and found that hearing thresholds were worse for the smokers than nonsmokers at all frequencies tested (125 - 12,000 Hz). The association between smoking and noise on hearing loss was reported after that by Barone et al (17). Moreover, Virokannas and Anttonen (18), Noorhassim and Rampal (19), Palmer et al. (20), Ferrite and Santana (21) and Ohgami et al. (22) observed a positive correlation between the three factors, but without performing bioassays (cotinine). The three combined factors are considered to have an additive rather than synergistic effect; based on most of the previous surveys. The current study was not in agreement with that of Nondahl et al. (23) who did not find an association between cigarette smoking and cotinine in serum. Yet, this same team had reported a positive association (24). The achieved results through the salivary cotinine determination biologically corroborate the Fagerstrom test of nicotine dependence and can validate the hypothesis that associates the degree of nicotine dependence and environmental noise to hearing loss (Table 2, Figures 1 and 2). It is worth mentioning that ototoxic substances other than nicotine that enter the chemical composition of mainstream cigarette smoke can affect hearing in combination with noise exposure. Cigarette smoking may also affect hearing through its effects on anti-oxidative mechanisms or on the vasculature supplying the auditory system (25), which opens a perspective for future studies in this area. In conclusion, it is of great importance to give objective advice to civil authority and citizens in order to modify smoking habits, and environmental conditions or residency, which may prevent or delay age-related declines in hearing sensitivity. In addition, smoking per se is dose dependently incriminated with hearing loss at 8000 Hz; needless to say that the advantages of stopping smoking will reduce the innumerable harms that this habit causes to otherwise healthy individuals. Bearing in mind that hearing loss is an irreversible phenomenon and is very expensive to treat. Authors thank research committee of Lebanese University for funding this study.